Having migrated for four years after escaping the Russian revolution with dozens of followers and family members, Gurdjieff settled in France and established his Institute for the Harmonious Development of Man at the Château Le Prieuré at Fontainebleau-Avon in October of 1922. These essays and articles present reminiscences which describe activities at the Prieuré from different points of viewsome with great understanding and some with critical reserve or journalistic disdain. Excerpts from Prospectus Number 1. Fontainebleau: Privately printed, 1923, issued in English, French and German, 15p. (An original copy of this document can be examined in The Heap-Reynolds Little Review Collection at The University of Delaware Library. Sub-series F 21, 1926.) 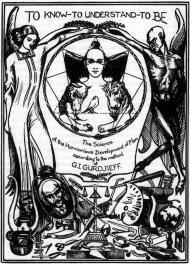 Beginning in the Spring of 1923, Gurdjieffs students were given a prospectus for the Institute for the Harmonious Development of Man that was also distributed to the public at movements demonstrations in Paris. It was the first statement about his past and ideas that Gurdjieff published in Europe. Gurdjieff's aphorisms as inscribed in a special script above the walls of the Study House of the Chateau du Prieuré at Fontainebleau in which Gurdjieff established his Institute for the Harmonious Development of Man. First published here, this invaluable first hand sketch of life at the Prieuré in 1923 by Dr. Mary C. Bell was written in September of 1949 and gives a warm, lively glimpse of the way Gurdjieff guided his pupils. March 1923New StatesmanClifford Sharpe responds to misleading published reports about the Prieuré. Modest and scholarly in tone, this account stands out for its informed insight into the workings of Gurdjieff's Institute. The title of this piece became a journalistic catch phrase of the day.